Low calorie snacks have become important for many reasons. 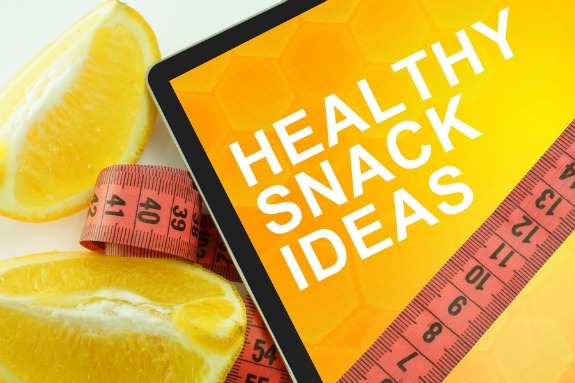 No matter what are reasons are when enjoying a snack we need to keep them healthy so we can maintain our desired weight or help achieve weight loss. So what makes a healthy low calorie snack? The less processed a food is, the healthier it is. So highly processed or fast foods are a big no no. Foods that are low in calories. Avoiding foods that are high in fat and sugars. It is also important to keep in mind portion size (this is why they are called snacks and not meals). My first and favorite snack now and forever will be fresh fruit. It is healthy, low in calories and easy to digest. Though apples and bananas are on top of my list (mainly because they are so convenient) any fresh fruit makes a satisfying snack. 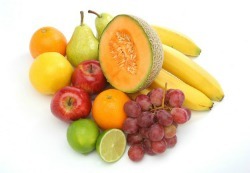 Any fruits that are in season are usually good choices as they should be reasonable in price and ripened to maturity. Apples, bananas, oranges, grapefruits, pears, melons, blueberries, strawberries, papayas, etc. Of course you know from our website that a cup of homemade soup is high on my list when it comes to enjoying a healthy snack or meal. Soup is low in calories, yet high in nutrition. You can't beat it with a stick. So check out all our friendly soup recipes. Many of our homemade and low calorie soups can be made in half an hour. Amazing. Click here to check out the many soup recipes that we offer. As long as you have a low calorie veggie dip, you are good to go. We usually start with the familiar carrot and celery sticks and then add any other goodies that we have in the fridge at the time. Try adding raw broccoli, cauliflower, cucumber slices, mushrooms, radishes, spring onions or whatever else you may have on hand. There are lots of low calorie dips now available in our supermarkets, or homemade versions can be made with sour cream or yogurt mixed with your choice of spices, dill or onions. 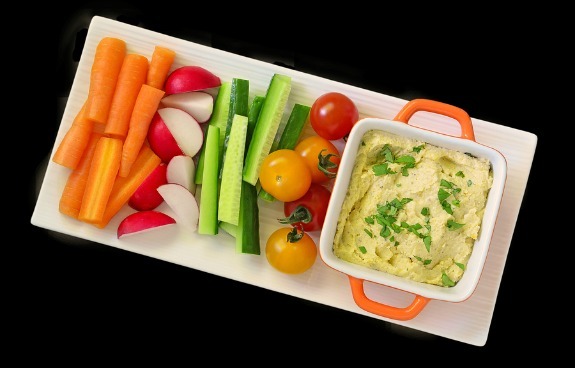 Choose the dip wisely as some will have more calories than the whole plate of veggies. 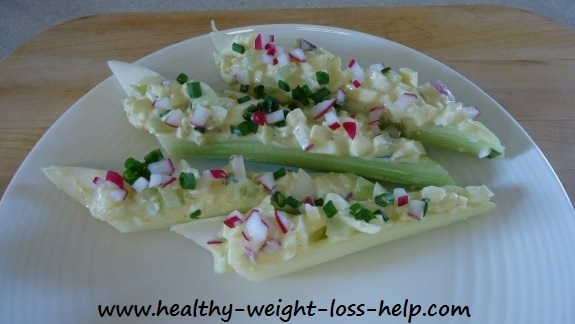 I just love either egg or tuna salad in celery sticks. It's easy, fresh and has a satisfying crunch. This was one of my friends' favorite dishes when he was with weight watchers. Ever since he told me about it, it has become one of my top 5 choices because it's so easy to make and it's so filling. As easy as opening up a can of six bean salad, draining it and adding a little light Italian dressing to it. This healthy, filling and super fast snack is definitely handy on those busy or lazy days. If I'm not really rushed it's nice to spruce this salad up a bit. On occasion I add fresh diced tomatoes, corn and chunks of avocado. Any yogurt will do. Weather it's a zero calorie yogurt or the ones that have about 100 calories per serving in them, yogurt is healthy, quick and can be quite satisfying. For some of us, the brands that have more fat in them tend to keep you satisfied for a longer period of time. So fast and so simple. A bowl of light popcorn is a filling 100 calories. It's also a good way to drink more water as your thirst can build up. Whether you prefer to peel your apple or to eat its peel, this is a great snack. Enjoy with a few pieces of your favorite cheese and your good to go. This one helps satisfy both the sweet and salty cravings. Choices can include peanuts, walnuts, pecans, cashews or almonds. Almonds are my favorite, not because they are lower in calories, just because they taste good. I like to take coconut water with fresh (or frozen) pineapple chunks. 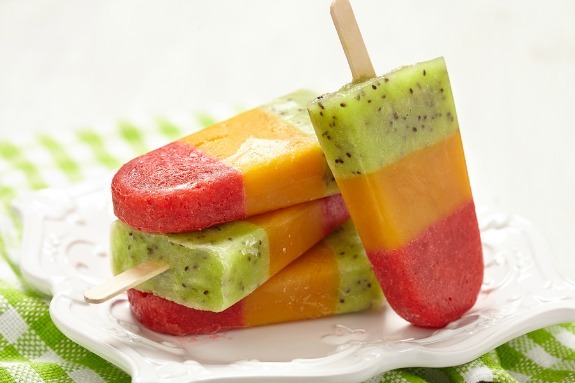 I mix these in a blender and then freeze them in Popsicle molds for snacks. It helps me avoid ice cream. Of course the flavors and choices you can choose are endless. You can have fun with this one. 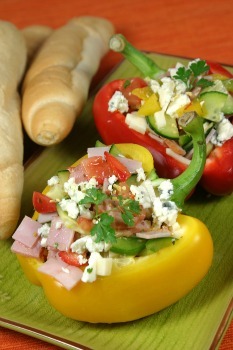 Click here to check out some of the salad recipes we offer. 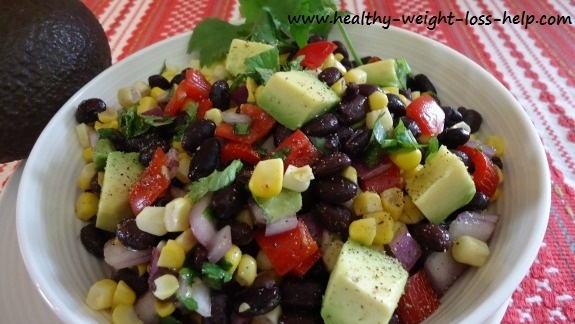 This can be a very filling snack and can be made into a whole meal by increasing the portion size. (This meal is amazing when dieting). A scoop of cottage cheese on a simple salad with a little low calorie dressing of your choice. The possibilities are endless. You can stuff them with egg salad, tuna salad, Greek salad, Caesar salad. Also adding a little lean meat can really spruce things up whether it be a little ham, chicken, beef or fish. Even add a little bread if you like because this is still a healthy snack. 1 cup raw kale— stems removed— dab with olive oil, sprinkle with sea salt (and other favorite spices like garlic powder) bake at 400° until crisp. There's an amazing new food service company called ZeroCater that specializes in providing companies with catered and other meals that are suited for you and your company. Check out what they offer here at ZeroCater.com. Do you find calorie counting helps you manage your diet or meal preparation? Then here is a handy calorie counter to help you keep track. Click here to use the calorie counter.